Lasagna is one of the oldest types of pasta, dating back to the 13th century. The name derives from lasanum, the recipient used to cook foods, but also laganon, a thin dough sheet of wheat flour cooked directly over the heat. Rustichella d’Abruzzo uses top quality durum wheat semolina and 7 fresh eggs from Italian breeding farms per kg of semolina. 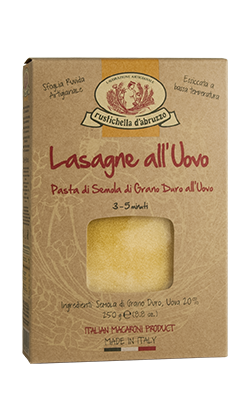 Rustichella d'Abruzzo Lasagne, thin egg dough sheets, rough and porous, are made with 7 fresh eggs per kg of semolina. Lasagne are indisputably the protagonists of a number of traditional gourmet vegetable-based recipes, or as a tasty timballo stuffed with grilled eggplants, bufala mozzarella cheese and fresh tomato sauce. If you prefer the classic tastes of the Italian culinary tradition, we recommend it with Rustichella d’Abruzzo ‘Ragù bianco alla Salsiccia’ or ‘alla Genovese’ sauces. Cooking time: 3-5 minutes.